Homeowners in Atlanta whose homes are not connected to a city sewer system need to know when to get their septic tank pumped. Septic tanks require regular maintenance to avoid total system failure. If your septic system fails, you are faced with the possibility of spending hundreds — if not thousands — of dollars to fix it. Aside from the expense, septic system failure can lead to harmful sewage backups in your home and yard. Regular maintenance and inspection of your sewage system will reduce the chances of this happening to you. Septic tanks are simple systems designed to contain the solids from your household waste and disperse the effluent — wastewater — back into the ground. The waste leaves your home through a system of sewer pipes, which converge into a single pipe connected to your septic tank. 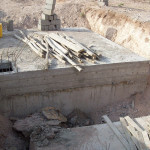 Once it reaches the septic tank, the waste begins to separate, with the heaviest solids — sludge — sinking to the bottom. A scum layer made of oils, fat and proteins floats at the top, while the effluent — gray water — resides in the middle. The effluent then travels through a system of perforated pipes and into the leach or drainfield. The perforated pipes often rest in a bed of gravel to help maintain adequate drainage until the effluent is absorbed into the ground. Septic tank failure is most commonly a direct result of improper maintenance and inspection. If the solids resting at the bottom of the tank are not removed, they build up over time and enter the pipes leading to the drainfield. When this happens, the heavy particulates in the waste become trapped in the leach field’s gravel, preventing absorption and causing your septic system to fail or back up. You can avoid the pitfalls of a failed septic system by initiating a regular maintenance and inspection schedule. The Environmental Protection Agency (EPA) recommends that homeowners have their septic systems inspected at least every three years and pumped as recommended by the inspector. This is not something that average homeowners can or would want to tackle on their own. To help avoid a septic tank failure, it is recommended that you hire a licensed plumbing or septic tank contractor to have your septic tank pumped. Homeowners interested in additional expert advice or septic tank service can contact Delta The Educated Plumber. For over 35 years, Delta Plumbing has met the plumbing needs of its customers in the greater Atlanta area, providing the best customer care and support in the industry.